Raigarh recruitment is 04-12-2017 before 05:00 PM. The candidates who are having the eligibility criteria they can apply through offline. This Raigarh District Court Sweeper, Waterman and Watchman Jobs Recruitment is 2017 purely based on offline applications. 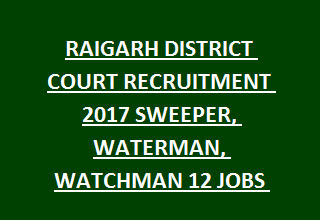 Click here to see the official advertisement of Raigarh District Court Sweeper, Waterman, Watchman Recruitment. Last date of the Application reaches to the district session court judge on or before 04-12-2017. The candidates must have qualified 5th class. Preference will be given to the candidates who are having knowledge of plumbing work, electrician, hardware, computer applications. As on 01-January-2018 the candidate's age limits are 18 to 40 years. Age relaxations are applicable as per Chhattisgarh government rules. The selection for this Raigarh District Court Recruitment will be held based on a personal interview and previous work experience. The remuneration is based on Group D Posts. The candidate has to download the application form from the official website of Raigarh District Court. Application has to be filled on his/her own hand writing. And the filled application has to be send to the below given address. On envelope must mention the post which you are applying. It has to be send through courier or speed post. On Cover Letter mention "Akasmikatha Nidhi se Vethan Prapth Kanevale Karmachari ke pad hethu Avedan Patra" For the Post of Sweeper/Chowkidar/Wateman"
Click here to apply online for the recruitment of Chhattisgarh court Chowkidar, Sweeper, Waterman Recruitment 2017. Please share this Raigarh District Session Court recruitment 2017 article to your lovable friends through online social networking sites. Written test for 100 marks with 100 questions 1.30 hour duration. Skill test will be conducted for 50 marks. The complete Exam Syllabus and Pattern for Raigarh District Court Recruitment is given in the official notification pdf.